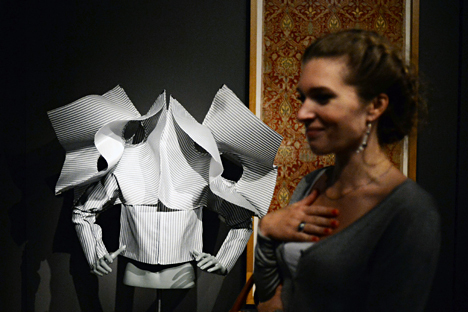 An exhibition "British Design: from William Morris to the Digital Revolution" organized by Moscow's Design Museum has opened in Russia's capital. Dedicated to the history of British design and running until the end of November, it is being hosted by the Pushkin State Museum of Fine Arts as one of the final events of the Year of Russian-British culture. "British Design: from William Morris to the Digital Revolution" is being exhibited near the Greek Court at the Pushkin State Museum of Fine Arts, next to ancient sculptures. It’s a symbolic location – the show's unofficial motto is: the relationship of epochs. Practically all exhibits are examples of 19th and 20th century design normally housed in London's Victoria and Albert Museum. Moscow's Design Museum began project planning last year, specifically for the Year of British Culture in Russia. Project Director Alexandra Sankova, who is also the museum's head, says the installation focuses on the relationship between the 19th century and modernity. Built around a shop decked out with designer goods - stylish coasters, egg boilers, table accessories from the 1960s and 70s - it is more contemporary art than museum. Some of the 'artefacts' are produced by 3D printers. It reveals the British designer as a digital artisan, an artist who combines new technologies: computer modeling, 3-dimensional printing, but also hand-crafted items. We see how much design responds to people's demands and is capable of creating something that seems impossible - to cater to individual tastes on a mass scale. "The designer no longer produces a finished good, but just creates a program, and then any person can go to the link, enter his particular requirements and receive the object in the needed size," says curator, Alena Sokolnikova. "This is what the founding fathers of design, William Morris and Christopher Dresser dreamt of." An outstanding example of this ultimate modern art is a sumptuous necklace collar produced by a 3D printer from layers of polyamide, a digital fabric. Designer Daniel Widrig experimented with the technique for a long time before succeeding in creating a firm yet flexible material. Lady Gaga-style Nova futuristic shoes are made of liquid rubber, with chrome uppers and vinyl and fiberglass features. Only the inner soul uses standard Italian leather. The shoes can add 15 centimeters to a wearer's height, but does not have a heel; an elegantly proportioned platform creates the sensation of soaring above the ground. All the objects reflect not only a determination to be technologically innovative, but also a key tendency in British design - inspiration from the past. "In Great Britain history did not stop like in Russia; this is why traditions have been preserved and contemporary designers rework and recreate 19th century designs," says Sankova. "Russia's history was interrupted, although not entirely destroyed. Young designers are now beginning to use folk materials, for example, wood: the Izba project created by Russian designers was shown at the Milan Design Week." Russian design is heavily influenced by European design and in particular, British design, whose main principle is functionality and comfort, rather than ornamentation. Russian designs are not yet being mass-produced and many everyday household objects are still imported. But Sankova is optimistic. "Russia now has a policy of import substitution and support for domestic producers. I think this will encourage our designers, because there is no production in the today's world that does not closely collaborate with designers," she says. Not only British design, but culture too has had an enormous influence on Russian art. Russia's avant-garde movement also strongly influenced British and European art in the 20th century. "European art is a melting pot and in each country you find the results of reciprocal influences. Brodsky loved English poetry, Russian literature influenced English literature and then English poetry in Russian translation became an aesthetic standard, just like English theater in our adaptations," says Marina Loshak, director of the Pushkin Museum. Although many may think of the Pushkin as a museum of classic art, the unconventional exhibition is no accident, but reflects a special interest in design. In the future the museum plans to create a dedicated educational space educational devoted to design. "One of our dreams is to create a completely different and special museum space, one completely outside our usual boundaries, which would be called Pushkin Design. We are talking about this project with the Victoria and Albert Museum, which is keen to help us with our dream," Loshak adds. The exhibition "British Design: from William Morris to the Digital Revolution" runs in the Pushkin Museum of Fine Arts till November 30.